This book presents the latest advances in ultrafast science, including both ultrafast optical technology and the study of ultrafast phenomena. It covers picosecond, femtosecond, and attosecond processes relevant to applications in physics, chemistry, biology, and engineering. Ultrafast technology has a profound impact in a wide range of applications, amongst them biomedical imaging, chemical dynamics, frequency standards, material processing, and ultrahigh-speed communications. 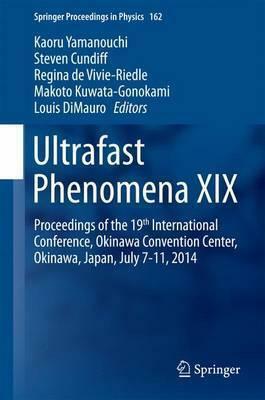 This book summarizes the results presented at the 19th International Conference on Ultrafast Phenomena and provides an up-to-date view of this important and rapidly advancing field. Illustrations note 302 Illustrations, color; 75 Illustrations, black and white; LXXX, 824 p. 377 illus., 302 illus. in color. Attosecond and High-Order Harmonic Generation and Measurement.- Atomic, Molecular, and Optical Science - Gas Phase.- Correlated Electron Systems, Magnetization, and Spin Dynamics.- Physics - Condensed Phase, Surfaces, and Low Dimensional Systems.- Chemistry - Condensed Phase.- Water, Hydrogen Bonding, and Hydration.- Biological Systems.- Molecular Light Harvesting and Charge-Transfer Complexes.- THz Science and Technology, Nano-Optics, Plasmonics, and Meta Materials.- Novel Pulsed Sources: Oscillators, Amplifiers, Nonlinear Mixing, Electrons, X-rays.- Frequency Combs, Waveform Synthesis, Pulse Shaping, and Applications.- Optics, Optoelectronics, Measurement, Diagnostics, and Applications.